Highlights include: Dads & Lads Breakfast, Mathathon, Traffic congestion, Four year old Fridays, BoT news and much much more! 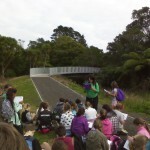 This week the senior syndicate walked down the Te Henui Walkway to East End on the lookout for bridges of all shapes, sizes, and construction as part of their term topic. Do you know how many bridges there are along the track? Did you know that Ara Puawhai means ‘pathway of enlightenment’? That’s certainly what the journey was all about for these amazing students!